The Tango--unique in many ways--has the solution for some of the major problems we have with automobiles today. Traffic has overcome the current freeway system. There are too many 4-passenger cars using an entire lane to transport a single person. There is also too much pollution from gasoline vehicles. Artist's drawing Solution: Reduce traffic and pollution with the Tango, a car that fits its use! This tandem two-seater can get you safely and comfortably to work and back without wasted space or fuel. The Tango--being 6" narrower than many motorcycles--takes less than half the space of the average car on the freeway, thereby doubling the capacity of existing freeway lanes. 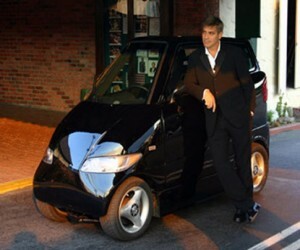 The Tango can fit in a future 6 foot lane easier than a truck fits in a standard 12 foot lane. To fight pollution it is available as an electric zero-emission vehicle. Parking too is a major problem for most commuters. Finding space to park in congested cities is difficult and time-consuming. Add in the cost of parking garages and lots or the extra hassle of moving your car and plugging the meter every hour or two, and people will jump to an alternative when it presents itself. That alternative is the Tango. Size does matter. As many as four Tangos can fit in one parallel parking space. Many parking locations also have spaces that only motorcycles and Tangos can fit in. Some other long-standing concerns on the show-room floor are safety, performance, and handling. Because safety is such a concern for small cars in particular, we have designed the Tango around a roll cage that meets or exceeds both SCCA and NHRA regulations. These are racing organizations that specify cage design to protect the occupants of cars crashing at over 200 mph. In addition, the extremely high strength-to-surface area ratio of a steel roll cage allows superb visibility from within the Tango. Rollover too is a great danger for many vehicles. The Tango, being so narrow, would look to the layman's eye to be unstable. But in fact, the Tango has stability that exceeds that of most sport cars. buried in asphalt. As far as performance goes, the Tango is no slouch. Since electric cars--especially small ones--are generally thought to be slow and weak performers we set out to blow some minds by designing the Tango to accelerate through the standing 1/4 mile in 12 seconds at over 120 mph and travel from 0 to 60 mph in 4 seconds. And as for handling, who would think a car this narrow could compete? All the people we beat at the autocross! Getting back to the more typical drive to work, consumers may be interested in the vehicle's range. Although the Tango can be built with a fuel cell or internal combustion engine, conventional lead-acid batteries work well for most commuters. Its 80-mile range is nearly 4 times the distance the average commuter travels per day. With high-tech batteries, range could exceed 150 miles per charge. To minimize any day-time inconvenience, the Tango can charge to 80% in just 10 minutes from a 200 amp charging station. This gives approximately 50 additional miles of range per quick-charge. Typically one would just plug in each night to a dryer outlet and get a complete charge in less than 3 hours and be ready for work the next morning. Length: 8'5" long, allowing it to park perpendicular to the curb. Batteries: 19 Hawker Odyssey's or Optima Yellow Tops. Li-Ion batteries are optional. Will accommodate Ni-MH batteries in the future. Charging: 50 amp on-board charger with Avcon conductive coupling. 200 amp off-board charger under development. Front Suspension: Unequal length A-arm with coil-over Bilstein shocks. Rear Suspension: Trailing arm with coil-over Bilstein shocks. Controller: Zilla Z2K motor controller, providing up to 2,000 Amps at 300 Volts (600 kW). Designed and built by Otmar Ebenhoech at Café Electric LLC in Corvalis, OR. Motors: 2 Advanced DC FB1-4001 9" motors, one driving each rear wheel with over 1,000 ft-lb of combined torque at low rpms. 8,000 rpm redline. Transmission: 2 direct drive gear boxes designed by Bert Transmission of St-Constant, Québec, the leading manufacturer of dirt circle track race car transmissions. 10 available ratios from 2.92:1 to 5:1. Standard ratio is 3.25:1. Splined axles can be easily locked together with center sleeve. Hubs/Wheel Bearings: As used on the Mazda Miata. Brakes: Mazda Miata calipers with Hawk HP Plus (rear) and HPS (front) pads. Wilwood master cylinder and pedal assembly. HVAC: 12,000 BTU Vintage Air air conditioning system driven by variable speed AC motor for predictable climate control. 3,000 W electric heater for instant-on, powerful heating. Seating: Tandem Sparco custom bucket seats with 4-point aircraft pilot harnesses on attached structures. Passenger straddles the front seat and harness structures which do not interfere with the passenger's knees. Storage: Passenger and a few bags of groceries with rear seat installed. Removed, it allows seven 10-ream cartons of paper with the driver's seat in extended position. (Rear seat with harness structure is removable through rear hatch.) Multiple compartments for smaller items. Headroom: 39" driver and passenger. Trailer Hitch: Accepts standard 1.25" hitch for towing generator cart for extended range. Front hitch for moving small airplanes.